Buckeye Bookkeeping Solutions - Serving Central Ohio- What our customers say about us.
" I have over 25 years in small business management and accounting services. Call for a FREE CONSULTATION !" Recommendations by customers of Buckeye Bookkeeping Solutions! Buckeye Bookkeeping Solutions has saved our company a significant amount of expense in bookkeeping services, has helped simplify our billing process, and has reduced our stress level by managing the accounting aspect of our small business. We no longer worry about tax deadlines, Federal, State payroll reports, quarterly reports, bank reconciliation's, etc. Our information is always completed in detail and in a timely manner. Sherry has demonstrated never ending patience with me, taking time to guide me through our new accounting software (which by her recommendation has reduced my customer billing time in half), and to recommend additional time-saving services. She is always professional, friendly, informative and prompt in returning telephone calls or emails. Sherry has helped to educate me by providing reference to areas regarding possible additional tax deductions and updates to changes in regulations that could affect our business. 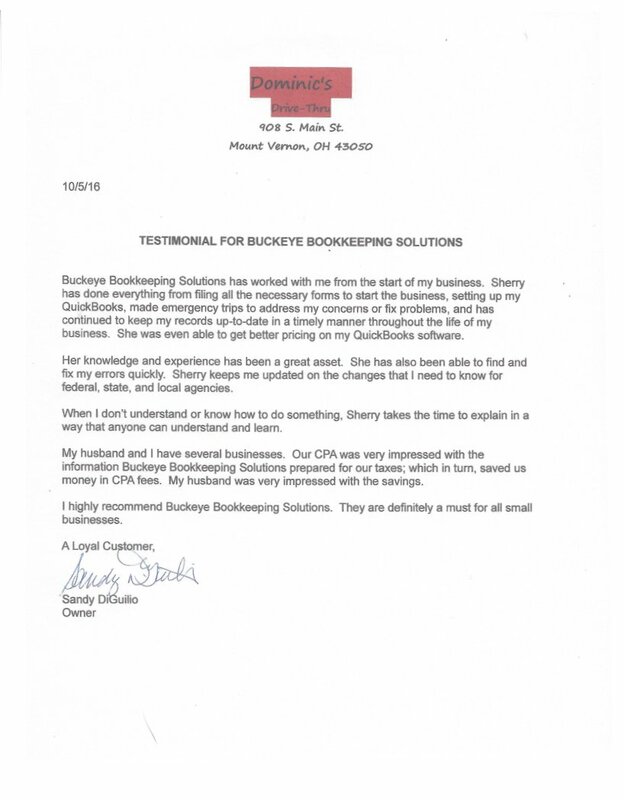 Our company is proud to recommend Sherry Wilson to any small business owner and is grateful to be affiliated with Buckeye Bookkeeping Solutions. Just wanted to drop you a line to express our gratitude for all your considerable time and energy in making the accounting end of our business a success. We could not have done all the setup without you. Your patience, professionalism, and general knowledge of business have made our task of endless paperwork maintainable. Thank you for always calling us back and the personal service. Thanks again, and our business is happy to be affiliated with Buckeye Bookkeeping Solutions. tPlease feel free to contact me regarding any questions you may have regarding our small business management and accounting services. Services Available to Help you..
Hosting & Internet Marketing By: WADSAA Designs, Inc.